With Soyuz Norwegian art rockers Gazpacho return and present the follow-up of Molotow, an album which shows reference to their past and gives a glimpse in what might be their musical future. The songs are like short stories and tell about a moment frozen in time. The opening track is Soyuz One and is about the first Soyuz capsule and cosmonaut Vladimir Komarow who died when the capsule crashed to the ground due to a parachute failure. Slowly it starts and creates a beautiful, but threatening atmosphere. Minimalistic in their own way they fabricate their sound universe. With a up-tempo rocker called Hypomania they surprise the listener. Even if its build upon drums and keyboard as usual, it's different. Exit Suite is a short track, at least for Gazpacho, and serves as an intro for Emperor Bespoken. Emperor Bespoken is an enchanting tune with a catchy melody. For someone who doesn't know Gazpacho this is a good way to dive into the ocean of Gazpacho's sonic universe. With Sky Burial their sound changes a bit. While the repetitive keyboard stays throughout the song, the other instruments create an atmosphere which gets more intense and mystic on the way. This one is about the ritual sky burial of Tibetan monks. An enchanting prog rock tune is Fleeting Things which shines through Jan Henrik Ohme's vocals. Soyuz Out is the longest track with 13+ minutes, a lot time to tell a story! They pick up the drum beat from Soyuz One, but keyboard and vocals push it into another direction. The closer is Rappacchini, a song which I guess is lyrically based on Nathaniel Hawthorne's short story Rappacini's Daughter. Minimalistic with an enchanting violin and vocals. Only critic, it's too short. 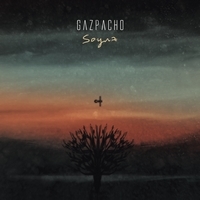 Everybody who is in ambient music / art rock should check out the new Gazpacho album. I recommend to listen to Hypomania and Rappaccini to get the an idea about Soyuz.